Welcome to CookingWithCricut.com and our Monday Cartridge Showcase. Today Chef Charlotte is taking over and sharing projects that she has created using Cricut's French Manor cartridge. This cartridge allows you to accent your projects with a touch of old European elegance. It is filled with exquisitely rendered images such as fleur-de-lis, furniture, and other accents. 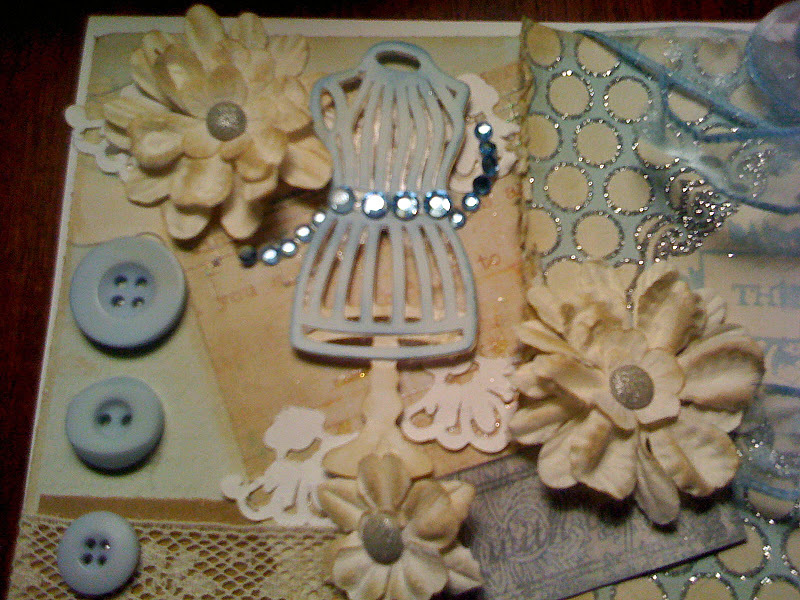 You’ll also love the coordinating tags, cards, and borders included. So without further ado, here's Charlotte! Hi everyone!! How exciting it is to be showcasing one of my very favorite cartridges. This cartridge has some of the most beautiful and versatile cuts of all the Cricut cartridges. First I want to share with you a note card I made just for this showcase. 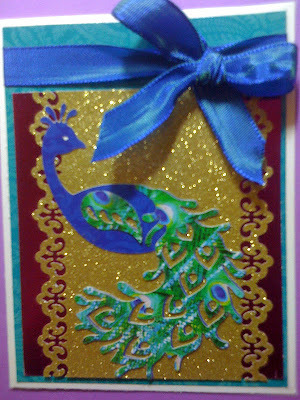 This is an A2 card made with paper from DCWV’s Royal Garden. I just fell in love with these two stacks. The colors are vibrant and the patterned pages are gorgeous!! A couple of the pattern pages have peacock feathers on them. So when I decided to make the card using the peacock cut, I knew I had to use that peacock paper. Doesn’t it make the peacock look beautiful! The ribbon is some I found last year at Michael’s, and I wish I had gotten more rolls of it. It is perfect for this card. This next card has a totally different look. It is made a border and frame from French Manor. 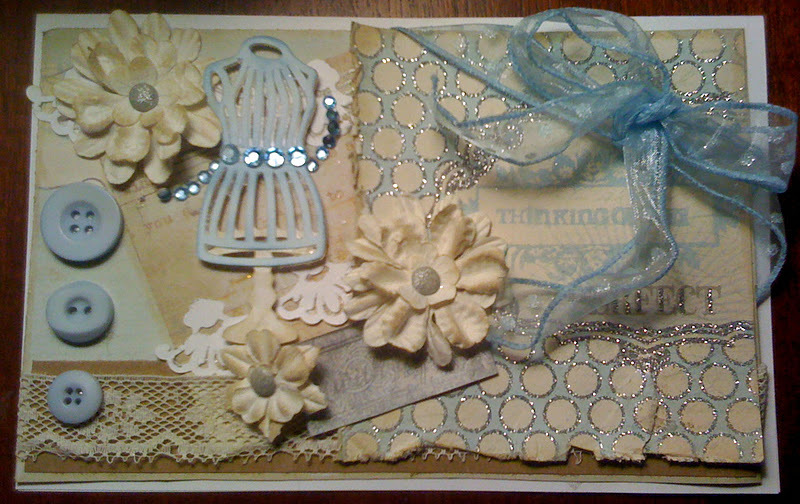 I made this card for a friend I work with who is going through a very difficult time in her life. Don’t you just love this border that I cut for the sides of the card. I especially love the way it has a slight curve to it. The pretty frame in the center is stamped with a sentiment stamp from K Andrew Designs. 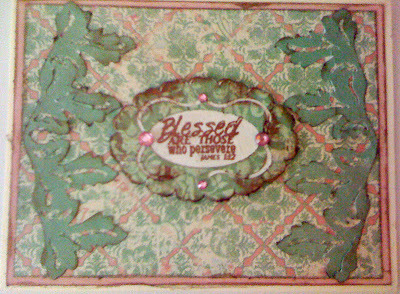 This stamp is from a set called Scripture Sayings. I hope this will be encouraging to my friend. This next card was made for a challenge who's theme was “Time For A Change”. If you'd like more details about this card here is the link to the post on my blog. 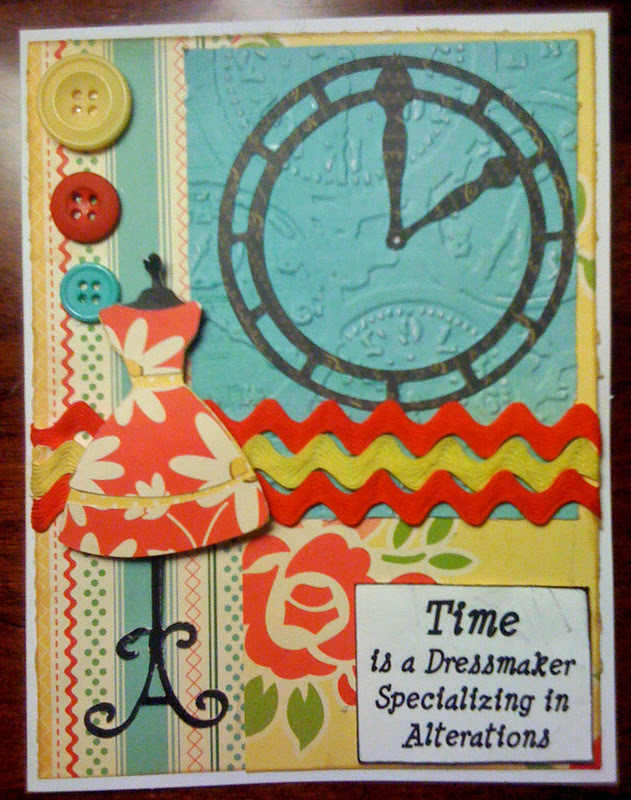 The card is embossed with a pocket watch folder from Tim Holtz. And the clock is cut from the French Manor cartridge. The dress form is cut from Nifty Fifties cartridge. I am sure most people would never think that these two cartridges could be used on the same project. But, surprise, surprise, don’t these look great together! As I said, the French Manor cartridge is so versatile. 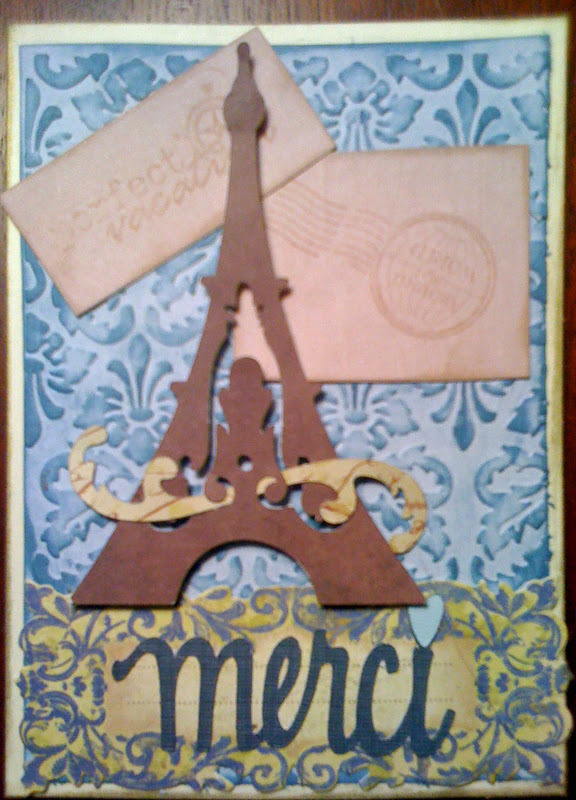 Next I have a card I made for a friend who was going to spend this past summer in France. It was to wish her and her family a great trip and to say thank you for the fabulous gift card they gave me at the end of last school year. 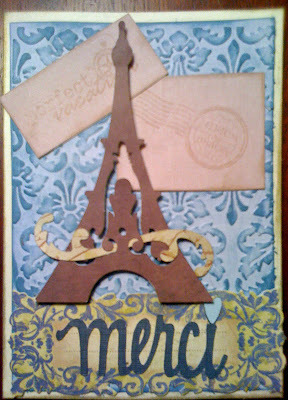 A beautiful cut of the Eiffel Tower and a pretty sentiment cut. This next card was done last year for a challenge. I just think it says "COUNTRY FRENCH" in bold letters! Take a look and tell me what you think. How gorgeous is this dress form!! Isn’t this just beautiful done in that pretty French blue. I love it!!! Doesn’t this just make you want to hop on a plane and head to Paris, the vineyards, or the French Riviera? Thank you for letting me share some of my favorite things with you. Oh my goodness, Charlotte! 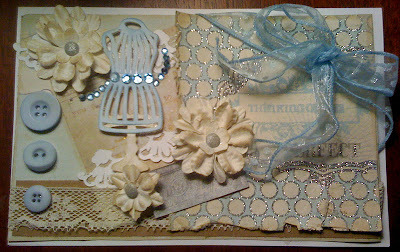 One beautiful card after another -- and so many little details that make each one so special!! Please make sure to give Charlotte a visit at her blog and let her know how much you enjoyed her showcase! Okay now I want to go pull this cart out and play..Love your peacock. Wow, your projects are beautiful! The cuts are so intricate! TFS.